I thing i'm not able to put the blueprint correctly, because it's impossible to have (for example) placed correctly on the top, side & front viewports, also I place the blueprints at o,o,o (X,Y,Z) except for the front one that is a bit advanced so I can see it. What I do with the blueprints is cut all them so the picture has exactly only the car, there's no white unnecesary. But when I end doing this, if "Side" is 450pxX130px, front is 150pxX129px, rear is 152pxX131px, etc. This causes me trouble so viewports and the 3d model don't match. blueprints rarely match up in 3D viewports as such unless they were created from an actual 3D model. More than likely, due to the construction/drawing technique used for the images, the prints aren't going to line up perfectly. -Do some reference on such sites as autos.msn.com, which has the dimensions of most vehicles after 1988, or wikipedia which usually has vehicle dimensions. Once you know your blueprints are scaled correctly, you can spot any errors with alignment that might be there. -make good use of photographic references. The more you use, the more accurate your vehicle can be. Don't hesitate to spend some time lining a camera/perspective viewport up to match a real photograph. Once you get the camera settings to perfectly match the car, you can very easily spot inaccuracies that may have existed in the blueprints. Even photographic blueprints that I make have a lot of room for error, so always assume prints are incorrect and use references as your stabilizer. -consider tracing the shapes on the blueprints out with splines. You can create a rough spline cage, then conform that about to the blueprints, and you should be able to tweak the splines a bit easier than you'd be able to tweak geometry after it's been created. 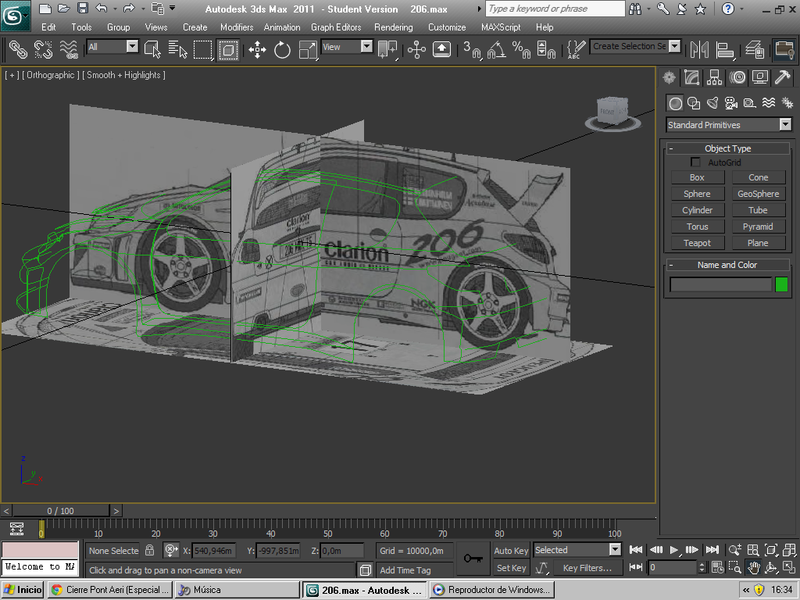 Use the final spline cage that you're happy with to model the vehicle after, instead of the blueprints. Not saying you can't go back to using them, but the spline cage would be at least guaranteed to line up now. Good luck with your vehicle. Looks like you've picked a pretty interesting one to start from! I ended doing it in a 2002 206 WRC, and I assumed to made what you said, use the blueprints to make the splines and then use proper images to use them as reference. why you make the car with NURBS and not with polygons?? Its called a spline cage guile, we use spline cage to correct inconsistency's on some blueprints that doesn't line up or match sides. It doesn't have to be high in detail just to get the shape and dimensions right. But i've seen some in detail so that will have to be on the artists preference. Its called a spline cage guile, we use spline cage to correct inconsistency's on some blueprints that doesn't line up or match sides. It doesn't have to be high in detail just to get the shape and dimensions right. But i've some in detail so taht will have to be on the artists preference.